Parentini UK Stockist | Parentini cycle clothing available at Northern Ride with their famous Parentini Mossa now in stock. It was 1976 when the twenty years old Gianpaolo started to work in the family clothing production business of high quality Italian clothing. His passion for cycling led to Paretnini's first cycle clothing which was immediately appreciated by the experts because it's high quality, this gave Parentini the opportunity to form an excellent relationship between its customers and champion cyclists. From the first success Parentini has grown every season, every time improving the technical aspects and their image in the cycling world. The Parentini philosophy is to join the fashion aspects cycling to the request for technical garments. After 30 years the tradition continues at Parentini and it is now available in the UK at Northern Ride. The highlight of the Parentini range is the Parentini Mossa; a garment specifically designed for weather that we experience in the UK. If you want to ride in style with products that are designed and manufactured in Italy for their technical superiority then Parentini is for you. The Parentini MOSSA line is realized with ELASTICIZED fabric, a WINDTEX membrane and is windproof, waterproof and breathable. This is achievable due to the research and design of Parentini products with the MOSSA featuring water-repellent "HYDRO" treatment. 1. 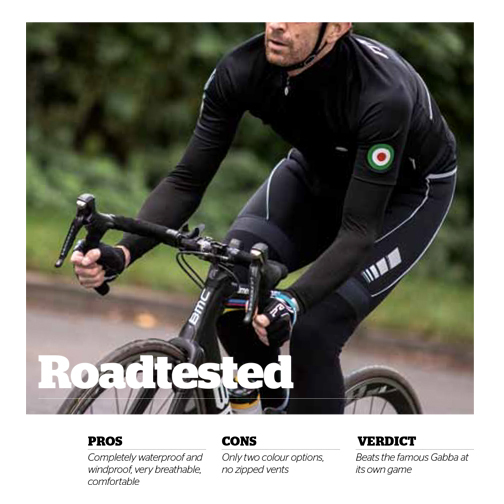 The user of the product has to be an amateur cyclist of medium/good level, used to bad seasons or difficult training conditions, with a minimum power and that sweats in winter too. 2. The Parentini Mossa range can be used with temperatures from under the zero to +15c°. You would complement with the underwear depending on the season and on your own cold resistance. The Parentini base layers are also a technical product and are designed to work in collaboration with the Mossa. 3. Skin wearability of the MOSSA is essential for the perfect function of it. The product achieves the desired results if it fits tightly to the body and it works “allweather” since it transports your sweat out of the garment, becoming a thermoregulator. The WINDTEX membrane of the Parentini Mossa absorbs your sweat, warms you and whilst protecting from the elements, while the WINDSTOPPER (of Casteli Gabba) expels the sweat and remains colder; WINDTEX gets wet and evaporates, it remains warm and, at the same time, it guarantees you with optimum breathability. The fabric used for the MOSSA line is made up of a microfiber highly hydrophilic that carries the sweat to the membrane and through therefore lets it evaporate. The WINDTEX membrane is not only water-repellent, but it is WATERPROOF AND WATER-REPELLENT thanks to the HYDRO treatment you have on the external fabric. “The Castelli Gabba jersey is a worldwide smash hit so it’s no surprise that other manufacturers are trying to get a piece of the action. Parentini is an italian brand with a history as long and storied as Castelli’s. Rather than settling for a ‘me too’ product and copying the Gabba, Parentini have looked at ways of improving on it. We know that the Gabba is only water-repellent and soaks through after a while. More problematically, it loses its water-resistance after just a few washes unless you use softener-free detergent (though its label doesn’t say that). Parentini claim their new Mossa is fully waterproof, four times stretchier than a Gabba and washable because its water-repellency doesn’t rely on a surface treatment, yet it’s also fully breathable. The key to this black magic is the Windtex fabric. The Mossa soon proved itself to us. Rain simply beads off and it’s fully windproof, forming a complete barrier to our sullen climate. It’s warm enough for cool days with just a base layer and it’s very effective if worn with water-repellent arm warmers. The stretchy fit is very comfortable though it does feel more like a light jacket than a jersey. The breathability is good – far better than a traditional rain jacket – but it does need a tight base layer. The above information has been provided by Parentini and our staff have received training on the suitability of the Parentini winter collection directly from Parentini for the 2016 collection.